The Lil Faider Interfaith Scholar-in-Residence Project was pleased to announce the selection of Islam as our religion of focus for the third year. Given the current effort of building relationships with the Calgary Muslim community through the Calgary Jewish-Muslim Council and the Calgary Interfaith Council, it is an opportune time to deepen our understanding about Islam. 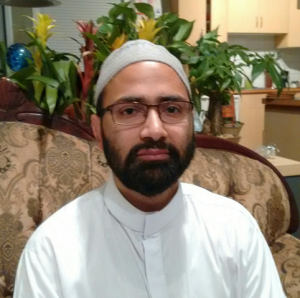 Our initial study will begin with Imam Sayed Hadi Hasan of the Hussaini Association of Calgary (Shia). Imam Syed Hadi Hasan is a respected and knowledgeable speaker and lecturer to interfaith groups and a distinguished representative of the Calgary Shia Muslim community. Imam Hasan was born in India and acquired his qualification of Aalim (Scholar) from the Allahabad Board (accredited by the Indian government). His Master’s thesis in Farsi was titled, “Peaceful Co-Existence among Religions according to Quran and Sunnah.” Among his leadership roles in the Muslim community, Imam Hasan has lectured and engaged in religious activities in the UK, India, Geneva, Mombasa, and Kampala. He has actively participated in interfaith dialogue as an advocate of cooperative, constructive, and positive interaction. Before coming to Calgary, Imam Hasan served the Baab-ul-Ilm Centre in Leeds, UK. Please click here to read Imam Syed Hadi Hasan’s BTZ Shofar articles. Please see our videos from Imam Syed Hadi Hasan’s lectures below.